PA security forces have been ordered to 'maintain calm and quiet' so as not to invite a strong Israeli intervention before September. Palestinian Authority chairman Mahmoud Abbas reportedly ordered his security chiefs Sunday to maintain calm and quiet in PA enclaves in Judea and Samaria in order not to prompt a strong Israeli intervention before his planned statehood bid at the United Nation's in September. The order comes as Israel is engaged in retaliatory raids in Hamas-run Gaza for three days of ongoing terror attacks that began on Thursday with 8 Israelis killed and 33 wounded in a multi-staged attack on a civilian bus near Eilat. PA officials did not condemn the deadly attacks or issue condolences to Israel, but rather took the occasion to "warn" Israel not to use them as a pretext to attack Fatah and - more egregiously - insinuated Israel's retaliatory strikes on Hamas were about scuttling the PA statehood bid rather than protecting its own citizens. AFP reported former Black September terror-financier-turned-politico Abbas met senior PA security officials and laid out for them the political and policy developments leading to the bid, saying they "must continue to maintain security and stability in order to further the political interests of our people." Abbas explained "we are determined to turn to the UN in September and receive recognition because of Israeli government policies. What Israel is doing now will not deter us from continuing to claim our rights." 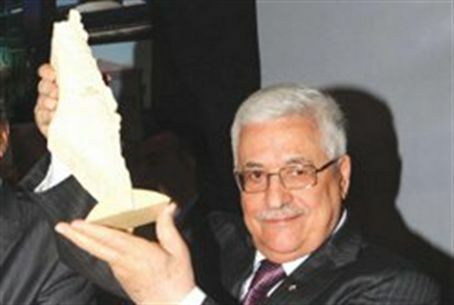 Also Sunday, Abbas said he looked forward to seeing the Lebanese flag flying over Jerusalem when it will be in PA hands. Sources say PA security officials are quietly concerned they may be asked to exert PA "sovereignty" is parts of Judea, Samaria, and Jerusalem after the United Nation's bid, which would put them into direct armed conflict with the IDF. The PA security forces consist of some 41,000 men - 11,000 more than allowed by the Oslo Accords - armed and equipped as light infantry. It would be nigh impossible for such a force to survive sustained hostile contact with a world-class military like the IDF.